Cyclones that traverse the Indian peninsula from the Bay of Bengal to the Arabian Sea are a common enough feature. But over the past few years, the devastation they cause in Kanniyakumari district has increased because of deforestation. 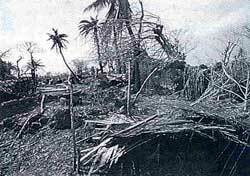 THE CYCLONE that struck southern India in October-November 1992 caused unusually extensive damage in Kanniyakumari district. The area was lashed daily by winds of 80 km per hour and 10-15 cm of rain. There were landslides, and major roads, railway tracks, bridges and houses in the district were washed away. Water in the swollen rivers turned red with silt. Erosion was so great the waters of the Arabian Sea were red for several 100 m from the shore. Official estimates put the property loss caused by the cyclone at more than Rs 30 crore. Of this, Rs 7.86 crore have been attributed to loss of crops -- 7 lakh banana plants, 1,500 ha of rice and several ha of coconut, rubber, clove and tapioca estates. Catalysts of destruction Ironically, these plantations acted as a catalyst for the devastation. Records of cyclones affecting the district over the past 150 years show the extent of cyclonic damage has increased as a result of the destruction of forest cover. According to The Travancore State Manual of 1906, "At the close of November 1845, a cyclonic storm formed over the Bay of Bengal and crossed the southern Indian peninsula to the Arabian Sea. Violent gales and stormy winds lasted for a few hours, accompanied by heavy rains. Travancore (including Kanniyakumari), however, was not affected by cyclones owing to effective protection it got from the hills. Most of the cyclone winds got dissolved or were counteracted by the vegetation in the hills, the result being only torrential rains." The Travancore State Manual of 1940 reports cyclones hitting the district in 1922-1924. Except for damage to telegraph poles and roads, there is no mention of any drastic loss in the district. Depressions form frequently in the Bay of Bengal during the receding monsoon (October-November) and move in a north or north-westerly direction. The depressions occasionally develop into cyclones. But more worrisome than the occurrence of cyclones during the waning monsoon is the effect of widespread tree-felling on the intensity of cyclonic devastation in Kanniyakumari district. A century ago, M A Lawson had described the forest cover in the hills as "so dense... it was impenetrable, inaccessible and remote" (Records of the Botanical Survey of India, Vol I, 1984). As things stand today, Kanniyakumari, the southernmost district of Tamil Nadu, has only 23 per cent of its less-than-200,000 ha of land area covered with forests. Most of these forests are thin and secondary. Persistent deforestation to make way for rubber and tapioca plantations has been the most destructive form of land use in the district because it has ignored the necessity of natural vegetation. The clearing of forests has only intensified cyclonic destruction, as was clearly evident last year. The deforestation of the hills started early in the 19th century with the arrival of British coffee and tea planters. The ravages of the British were partially offset by teak and rosewood reserves maintained by the Travancore maharajas. After Independence, the Indian elite took over the plantations and tampered considerably with the forests. Till recently, encroachment had always been the norm. A fine example of exploitation by and negligence of private landholders was the case of a major fire destroying more than 354 ha of forest cover in the Mahendragiri range in 1970. The most destructive form of land use in the hills came with the introduction of rubber by the forest department in 1957 and the subsequent establishment of a government rubber factory. Vast areas of forests were rapidly destroyed to accommodate this commercial crop and today, more than 5,000 ha of forest land are under plantations, most of which grow rubber. With the growth of rubber plantations, labourers from Kerala also moved in. Unauthorised settlements have been set up along forest roads in the plains for nearly 5 km at a stretch. There are more than 500 thatched huts, with an average of four people living in each hut. Besides, large areas of forests have been cleared to rehabilitate the Kanis, a tribe that used to practise shifting cultivation. There are 47 Kani settlements spread over an area of 1,200 ha in the district's forests. The Kanis are dependent on the natural vegetation around them for firewood, fodder and thatching material. Primitive cultivation practices such as the planting of tapioca and coconut on cleared hill slopes and the extensive cultivation of tea, rubber and cloves on ground clean and devoid of "weeds" have exposed the top soil considerably. Thus, in a region that receives less than 2,500 mm of evenly distributed rainfall annually, the recent floods and landslides are obviously the fallout of inadequate natural vegetation cover in the hills. There is no longer any vegetation to check the flow of rain water down the slopes and gullies. As a result, dams filled up and their sluice-gates had to be opened without adequate warning to people living downstream and in the plains. The cumulative effect was the extensive, and avoidable, loss of property and human lives. R J Ranjit Daniels works with the Madras Crocodile Bank in Mamallapuram and A E Dulip Daniels is with the Scott Christian College in Nagercoil.